Ruskington Bowls Club ended a tough week in the leagues on a winning note in knockout competition. The first aggregate defeat was a home fixture with Ruston in the City (evening) League despite wins for Paul Butterworth, John Hurst and Linda Picton (14-13), and Jim Matson, Isabel Drain and Les Warren (21-19). The third set of Tony Codd, Keith Pilbeam and John Sanderson went down 9-22, as Ruskington took four of the 10 points on offer. * Collingham visited in the District League which brought just two points. Scores: Trevor Harding, Jock Mitchell John Booth won 27-15; Kath Booth, Sue Mitchell, David Miller lost 10-18; John Sanderson, Paul Butterworth, Tony Codd lost 17-27. * The Woodhall Spa League match at home to Heckington also salvaged just two points. David Miller’s set of Isabel Drain and Jock Mitchell lost 13-22, and Les Jenkins with Zack Thompson and Allan Cowie went down 10-20, but John Hurst, Joan Cowie and Graham Croft survived dropping an eight count on the penultimate end to edge home 21-18. * There were more mixed fortunes, and only two points, in the Cliff League at Bardney. David Miller, with Les Wilkinson and Trevor Harding, won 22-15, but Jim Matson’s set of Jim Barclay and Jock Mitchell won just four ends in a 31-9 loss, and George Glover, with Jock Mitchell and Linda Clifton, lost their last five ends, to go down 18-23. * The trip to Skellingthorpe for the City (afternoon) League match was better, with four league points. Tony Codd’s set of Les Wilkinson and Jim Barclay won 19-18, and John Booth, with Carol Croft and Jackie Ray, did well to win 20-12, but Les Jenkins, with Isabel Drain and Graham Croft, were outclassed, dropping a seven on the penultimate end to lose 30-7 down. 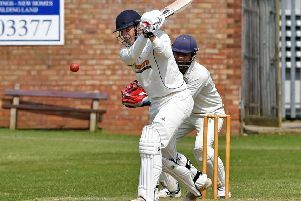 * Ruskington’s final match was a repeat fixture at Wrangle B in the Fred Powell Memorial Trophy. Tony Codd, with Keith Pilbeam and David Miller, narrowly lost 14-15, and Jackie Ray, with Les Wilkinson and George Glover, also lost 14-19. But Waylon Clarke with Jock Mitchell and Lorraine Clifton won 19-10 to seal a 47-44 win and progress to the next round.